Your horse depends on his shoes to protect his hooves, to correct any problems with his feet and to improve performance, especially in competition. Various types of horseshoes have evolved to address equine needs in the millennia since shoeing became a mainstream practice in Europe. Your farrier can provide options tailored to your individual horse. 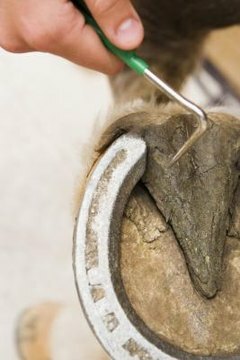 The basic horseshoe consists of a solid section of aluminum or steel in a U shape that follows the outline of a horse's hoof. The average shoe protects the hoof wall from wearing down too quickly, chipping or cracking. Your farrier attaches the shoe by nailing it into the hoof wall. The shoe stays on the hoof for roughly six weeks, to be removed and replaced when hoof grows and the shoe wears down. The egg bar and hind bar shoes both feature a full shoe design that puts shoe underneath the heel of the hoof as well as under the hoof wall. Bar shoes provide support for the heel as well as remedy certain gait and movement problems. The design of corrective shoes remedies flaws and corrects the hoof. Some horses need corrective shoes for life while others only require corrective shoeing for a limited period. Modifications to the basic horseshoe can provide better traction. Horses regularly used in speed events, such as barrel racing and pole bending, or ridden through rugged terrain, are outfitted with shoes that provide additional grip. Your farrier may also modify corrective shoes to provide additional traction, if your horse has hoof health issues that require treatment as well as a need for extra traction. Gaited horses have specific movements, and many owners who compete in breed shows with these horses have their horses shod specially with weighted and stacked horseshoes to accentuate the gaits. Specialty horseshoes should be applied by a farrier with extensive knowledge about how the horse needs to move and what type of shoeing keeps the hooves and joints healthy.